PFD is largely complete. NRST, ALT units and alternative units still to implement. MFD is functional, and now includes display and editing of the current flightplan, along with moving map, engine information. 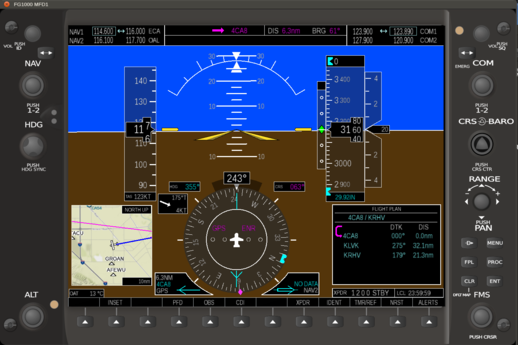 MFD and PFD can be displayed as a GUI window under Debug menu or added to an aircraft with the GDU-1045 model as part of a 3D cockpit. GFC700 autopilot is integrated and includes all modes apart from VNV (vertical navigation to follow a flightplan) and BC (ILS back-course). There's still a number of pages to write, and the more complex pages around route planning will likely be particularly challenging, but it should be far faster now these blocks are in place. See the Design Notes for details. Styling the pages - making the iconography match Garmin exactly. Click on the buttons, though some are not implemented yet. Use the mouse wheel to scroll the knobs (NAV, HDG, ALT, COM, CRS/BARO, RANGE, FMS). For knobs with both and inner and an outer (NAV, COM, CRS/BARO, FMS), scrolling when pressing the Shift key changes the outer knob. Use the outer FMS knob (shift-mouse wheel on the FMS knob on the bottom right) to navigate through the page groups. Use the inner FMS knob (mouse wheel on the FMS knob on the bottom right) to navigate through the pages within the group. The currently selected page is shown in blue. If you stop moving the cursor, the page will be loaded in 0.5s. Within a page, click on the FMS knob to activate the cursor (CRSR). You you should see some element highlighted on the page, typically flashing. You can navigate around the page using the outer and inner FMS knobs. The Outer FMS knob (shift-mouse wheel) typical moves the cursor between elements. The Inner FMS knob typically changes the selected item. Use the RANGE knob to zoom map views in/out. Artificial horizon, compass rose, altimeter and airspeed indicator are all hopefully obvious! There is a two channel NAV/COM with an active and standby frequency and automatic ID of NAV frequencies at the top of the UI. They all integrate with the standard properties, so should work automatically with most aircraft. If you have a frequency highlighted in any of the pages (e.g. WPT - AIRPORT INFORMATION) press the ENT key to load it into the standby NAV/COM frequency as appropriate. Press the DTO button (D with an arrow through it on the right side of the panel, below the word "PAN"). This will bring up a Direct To window, allowing you to enter the ID of an airport, Fix etc. to navigate to. Scroll the FMS knob backwards to bring up a sub-menu of waypoints categories (FPL, NRST, RECENT, USER, AIRWAY). Use the inner FMS knob to scroll between the different categories, and the outer FMS knob to select a specific item. Scroll the FMS knob forwards to enter an ID manually using the FMS knob. Use the outer FMS knob to move to the next poisition in the ID. Use multikey support to type in the ID using the keyboard - type ":ms" followed by the ID. This is by far the fastest method! Once you've got an ID, press ENT which will load details into the window and highlight the ACTIVATE button. Press ENT once more to load the Direct-to into the GPS and activate it. To view airport information, select the WPT - AIRPORT INFORMATION page. Use the outer FMS knob to move between the AIRPORT, RUNWAYS and FREQUENCY boxes, and the inner FMS to edit the airport ID, scroll through available runways, or highlight a frequency. To edit the current flightplan, press the FPL page, then press the CRSR and enter waypoints for DTO above. 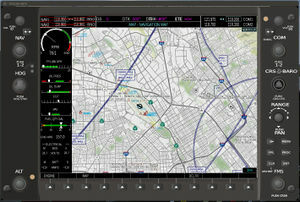 FD enables a Flight Director mode, displaying control bars to follow manually. Note that this button is disabled when the autopilot is enabled. HDG enables a heading mode, tracking the blue heading bug. Use the HDG knob on the PFD to set. VS enables Vertical Speed hold. Current target is displayed at the top of the PFD. It may be adjusted by using NOSE UP / NOSE DN. ALT enables Altitude Hold, which holds the current altitude. GA enables Go Around, which sets ROL to 0 and PIT to 7 degrees nose up. NAV enables NAV mode. The navigation source depends on what the CDI is set to on the PFD. Currently this is only implemented for GPS. APR enables Approach mode for both vertical and lateral GPS or ILS approaches. Will use the currently selected CDI source. FLC enables Flight Level Change, where the autopilot will maintain the current airspeed by pitch. NOSE UP / NOSE DN is used to set the target airspeed, which is displayed at the top of the PFD, and on the airspeed tape. Buttons toggle modes on/off, defaulting to ROL for lateral and PIT for vertical. The current pitch setting in PIT mode can be adjusted by using the NOSE UP and NOSE DN buttons. In PIT/VS/FLC mode, Selected Altitude Capture mode (ALTS) is armed, targetting the current altitude bug. Once the aircraft gets within 200ft of the selected altitude the autopilot will automatically transition to ALTS and then ALT mode to track that altitude. Note that once the altitude is fixed in ALTS mode changing the altitude bug will not change the target altitude. To improve usability, the FG1000 also supports multikey. If installed on the aircraft (aircraft developers need to include Aircraft/Instruments-3d/FG1000/fg1000-multikey.xml), the following keys are available. Adding the FG1000 to an aircraft is intended to be fairly straightforward. Place one or more of the display (GDU) units in your model. The XML files are in GDU104X directory and are named <model>.<device-number>.xml, e.g. The <device-number> is referenced later to identify which displays to used for each PFD, MFD etc. You must only used one of each <device-number> value, though you can mix and match the GDU models. The autopilot has been tuned for the Cessna 182, so may not be correct for light jets. This is used to provide airdata, navdata, NAV/COM settings, engine information to the GDUs. There is a generic interface (GenericInterfaceController) that uses the standard FG route manager, GPS, navigation data and NAV/COM settings, and engine data for a single piston engine. You may want to create your own version depending on what properties you are using for the NAV/COM, and your engine configuration. Note that you should only start the interface after you've started the FG1000 as they will publish information at start of day that the displays need. This is the Engine Information System and displays on the left side of the MFD. Copy Aircraft/Instruments-3d/FG1000/EIS into your aircraft Nasal directory. Re-name EIS-c182t.nas to something sensible (e.g. EIS-[aircraft].nas). Don't forget to rename the class itself! Copy one of the EIS .svg files from Aircraft/Instruments-3d/FG1000/MFDPages into your aircraft Nasal. Modify it as required, noting the names of objects and how they map to the EIS.nas file. Edit the SVG and EIS-[aircraft].nas as appropriate. In particular note that the Fuel submenu is used to set the contents of the fuel tanks manually, with a fuel totalizer approach. Copy Aircraft/Instruments-3d/FG1000/Nasal/Interfaces/GenericEISPublisher.nas into your Nasal directory, and rename it (e.g. [aircraft]EISPublisher.nas. Don't forget to rename the class itself! Modify it to publish the correct set of properties to Emesary. Note that for multiple engine aircraft you need to modify the publish() method. Copy Aircraft/Instruments-3d/FG1000/Nasal/Interfaces/GenericInterfaceController.nas into your Nasal directory, and rename it (e.g. [aircraft]InterfaceController.nas). Modify it to refer to your new [aircraft]EISPublisher. Finally, modify whatever Nasal you use to load the FG1000 to pass in the new EIS class and SVG file. Note that you need to load the EIS Controller, style and Options classes as well. # Load custom Interface controller, which will refer to the EISPublisher. Include Aircraft/Instruments-3d/FG1000/fg1000-multikey.xml in your -set.xml file to support multikey. See Howto:Add_multi-key_commands_to_an_aircraft for further details. #  Display a GUI version of device 1 at 50% scale. This is the current status of the individual pages. Full progress bars indicate that they are functionally complete, though the iconography is not correct. See Canvas_News#Moving_map.2FRNAV_discussion for the main article about this subject. The enormous variety in current glass flight decks means we really need to think of a new way of defining glass cockpit layouts. The airspace system is in the process of changing drastically [...] this isn't just a matter of throwing up a canvas showing some GPS waypoints and a magenta line. Modern navigators are astoundingly-complex devices — probably an order of magnitude more lines of code than FlightGear itself — and even their basic flight planning algorithms and databases (e.g. fly-by waypoints vs fly-over waypoints, open vs closed approach procedures, transitions into RNAV approaches, etc.) are far beyond the scope of anything we've tried, and we'd also need an up-to-date database far more complex than the ones we have now. Once you get to the extra features, like FIS-B weather or TIS-B traffic info over ADS-B, or TAWS (terrain alerting), we're probably in way over our heads trying to emulate even the simplest general-aviation IFR GPS. Instead of just making one-off tweaks like the consumer sims did, we (as a team) emulated entire systems like the vacuum, pitot-static, and electrical systems, so that failures would be realistic. In the RNAV age, we need to do the same thing; it's just that it's a bigger job. FlightGear will still be great for people who want to practice the mechanical parts of flying (e.g. crosswind wheel landings in a Cub), but will slip further and further behind for people who want to use it for real IFR practice. See Complex Canvas Avionics for the main article about this subject. See also Canvas_Development#Property_I.2FO_observations or Canvas_MapStructure#Performance. it's a lot of work to code all these displays which someone has to do, but there's no reason to assume it'd be hopeless performance-wise. we need to be realistic here: The G1000 is a fairly significant piece of computer hardware that we're going to emulate. It's not going to be "free" particularly for those on older hardware that's already struggling. However, hopefully we can offload a chunk of the logic (route management, autopilot/flight director) to the core, and do things like offline generation of terrain maps to minimize the impact. would it be possible to provide an offline tool to pre-fetch a region, like TerraMaster, or terrasync.py? Call me old-fashioned or paranoid, but I don't want FG to go online and do stuff automatically, I prefer downloading what I need manually so that I know what gets onto my harddisk. Also - think of all the people with poor home internet which might have larger bandwidth only in a library elsewhere. that would certainly be possible - the code retrieving the data is pretty trivial and porting the Nasal code to python or some other script should be straightforward. Getting the algorithms right, and keeping the data up to date every 7 weeks (we have only a tiny sliver of that data currently), is going to be much more of a challenge. I expect that it's probably an order of magnitude more complicated than our current flight dynamics (etc. ), so we'd have to grow our contributor base, and find funding to pay at least Curt (and maybe a couple of others) full time to manage the project. Note that that's what has happened for other complex FOSS projects, like office suites and browsers, which generally end up working through a foundation, rather than our current relaxed circle-of-friends arrangement. The reason it's so much harder now is that the software *is* the product for GPS navigators, FMSs, etc. (unlike with older avionics, where the hardware was the main thing). That means that emulating even a simple unit like the GTN 650 or GNS 430W is almost difficult as building one, so we're trying to keep up with armies of full-time software developers at Garmin, Avidyne, etc. According to the Route Manager wiki page, we already have support for SID/STAR data provided from Navigraph, which is released on the AIRAC cycle, and costs a pretty small amount (9 EUR for a single download of FMS data, or 90 EUR per year) Given the relatively low cost, I don't think that we as an organiation want to get into trying to digitize data ourselves just to make it open-source or public domain. Particularly given the low cost of a download. We might want to digitize the STAR/SIDs for the default airport with each release so there are some approaches available for those who don't want to purchase the data. For airspace data we could use https://openflightmaps.org/ . It provides community created navigation data for many countries in (currently only) Europe with a free license. we definitely want vector data. Stuart is hoping that we might convince the source of the raster data we're using at present to provide it as raw vector data, but we haven't had any luck so far. It would seem relatively straightforward to provide a scripted parser to create the corresponding charts procedurally. As a matter of fact, this could even be done in a background thread or using a separate Python script, i.e. if we wanted to ship pre-created imagery as part of fgdata. However, if the built-in Canvas system is extended to provide these charts, Phi could also be entirely self-contained by rendering the same airport charts without having to depend on external data sources. Following is the list of layers displayed by the G1000 system (see page 153 of the 190-00498-07 Rev. A), and mapping to the equivalent MapStructure Layer. Many of these would also be good to have for other avionics/GUI dialogs, including the NavDisplay framework, which is currently re-implementing this functionality separately, i.e. not yet using MapStructure. Following is the list of layers displayed by the G1000 system, based on the Garmin G1000 Integrated Flight Deck Pilot's Guide for the Cessna Nav III Garmin Site Wayback machine, page 153, and the mapping to the equivalent MapStructure Layer. Richard mentioned that if he were to implement approach plates in the EFB he'd probably use raster images provided via http and provide an http service within FG to do this, or to allow the EFB to use any other external web service. Other content for the EFB could be also provided as SVG via http. Rivers/Lakes VFRChart p.148 Currently using downloaded raster from web. Perhaps generate similarly to Atlas, or could be vector data from scenery. Tom originally suggested to render an ortographic view of the scenery/terrain to the canvas, thus the atlas-based approach should also work using Icecode GL's recent camview element. Topography Data VFRChart Synthetic p.145 Height-map at chart-resolution. Perhaps generate similarly to Atlas? Tom originally suggested to render an ortographic view of the scenery/terrain to the canvas, thus the atlas-based approach should also work using Icecode GL's recent camview element. International Borders p.148 Vector data from scenery? Track Vector p.156 Forward looking display of track. Look-ahead time selectable. Navigation Range Ring p.159 Straightforward extension of APS. Fuel Range Ring 159 Straightforward extension of APS. Terrain Data 364 Should be straightforward, with exception of obstacles. Profile view also required. Traffic TFC 394,423 Various options, each with different iconography and data displayed. NEXRAD 282 Heaps of weather data with complex symbology. Land/Country Text 148 Currently using raster data from web. Replace with POI? Cities VFRChart 148 Currently using raster data from web. Perhaps generate similarly to Atlas, or could be vector data from scenery. Tom originally suggested to render an ortographic view of the scenery/terrain to the canvas, thus the atlas-based approach should also work using Icecode GL's recent camview element. River/Lake Names VFRChart 148 Currently using raster data from web. Replace with POI? ChartView (Optional) 503 Rendering of PDFs. Might be possible to integrate with NaviGraph chart data? FliteChart (Optional) 521 Rendering of PDFs. Might be possible to integrate with NaviGraph chart data? See also Complex Canvas Avionics. Use NavMap for MFD Navigation Map, DirectTo, Nearest, Information pages. Improve the performance of the maps, perhaps using a cache for queries, definitely by more aggressive clipping of the SlippyMap layers based on map size. MFD.nas - top level MFD device, loads the other Nasal files (likely to be moved elsewhere later) and pages. PageGroupControllers.nas - controller for the Page Group display in the bottom right of the MFD, controlled by the FMS knob, and which allows selection between different page groups and individual pages. [PageName]/[PageName].nas - MFD page, inheriting from the MFDPage.nas. Creates any required MapStructure and hierarchy of softkeys. [PageName]/[PageName]Style.nas - Style controls for the MapStructure layers for the given Page. [PageName]/[PageName]Options.nas - Options for the MapStructure layers for the given Page. Most of the underlying Canvas MapStructure layers are now written (though they require styling, and/or would benefit from replacement with vector data). Emesary IPC framework is used to link between the MFD and underlying simulation state. This should make it easy to run the MFD on a separate FG instance, and provides a good demarkation between the individual aircraft systems and the FG1000 itself. Various underlying UI classes are used to handle highlighting, selection and scrolling of fields. See Canvas MFD Framework for details of the elements now supported. This section is intended to help keep track of related fgdata commits, so that if/when the project should stall, people can more easily look up related changes. ↑ Robin van Steenbergen (Oct 2nd, 2007). Re: [Flightgear-devel] Glass cockpit and external gauges. .
↑ geneb (Jul 3rd, 2017). Re: [Flightgear-devel] RFD: FlightGear and the changing state of air navigation . ↑ David Megginson (Jul 3rd, 2017). [Flightgear-devel] RFD: FlightGear and the changing state of air navigation . ↑ David Megginson (Jul 4th, 2017). Re: [Flightgear-devel] RFD: FlightGear and the changing state of air navigation . ↑ Thorsten Renk (Jul 4th, 2017). Re: [Flightgear-devel] RFD: FlightGear and the changing state of air navigation . ↑ Stuart Buchanan (Jul 4th, 2017). Re: [Flightgear-devel] RFD: FlightGear and the changing state of air navigation . ↑ James Turner (Oct 22nd, 2009). Re: [Flightgear-devel] ZKV500 GPS instrument; (New?) GPS code bug . ↑ Torsten Dreyer (Sep 29th, 2017). Re: [Flightgear-devel] Canvas MapLayer for OpenStreetMap, OpenAIP, VFR Sectionals . ↑ Thorsten Renk (Sep 29th, 2017). Re: [Flightgear-devel] Canvas MapLayer for OpenStreetMap, OpenAIP, VFR Sectionals . ↑ Stuart Buchanan (Sep 29th, 2017). Re: [Flightgear-devel] Canvas MapLayer for OpenStreetMap, OpenAIP, VFR Sectionals . ↑ James Turner (Jul 4th, 2017). Re: [Flightgear-devel] RFD: FlightGear and the changing state of air navigation . ↑ James Turner (Jan 5th, 2018). Re: [Flightgear-devel] [flightgear/simgear] Nasal regex patch . ↑ TheTom (Jan 9th, 2018). Re: Canvas G1000 . ↑ stuart (Jan 10th, 2018). Re: Canvas G1000 . ↑ Richard (Sep 29th, 2015). Re: . ↑ Torsten (Mar 17th, 2014). Re: Atlas still in use ? . This page was last modified on 22 February 2019, at 12:40.